What is the difference between DVI-I and DVI-D on NVIDIA based graphics cards? Most current NVIDIA based graphics cards feature a Digital Video Interface (DVI) connector for connecting a digital flat panel LCD monitor or projector to the card. A DVI connector is characteristically colored white (as opposed to a VGA connector which is colored blue). For every graphics card that features a DVI connector, the number of pins and layout of the pins on the DVI connector will vary depending on what type of DVI connector is found on the graphics card. 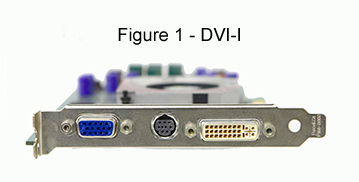 There are currently two prominent types of DVI connectors, DVI-I (Figure 1) and DVI-D (Figure 2). 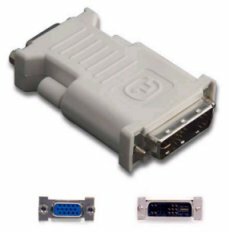 A DVI-D connector on a graphics card sends out a digital signal only, while a DVI-I connector can send out a digital signal (for digital displays such as flat panel LCD monitors) as well as analog signal (for older displays such as a CRT monitor) using a DVI to VGA adaptor shown below. 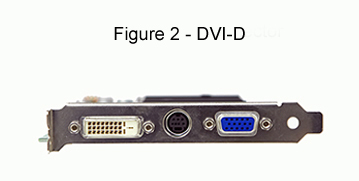 The graphics card shown in Figure 1 which shows a DVI-I connector contains more pins than the DVI-D connector shown in Figure 2. The extra pins on a DVI-I connector carry the analog signal which the DVI-D connector does not have. NVIDIA based graphics cards which carry a DVI-I connector are fully compatible with flat panel LCD monitors which typically have DVI-D cables. The DVI-D cable will read only the digital signal from the DVI-I connector on the graphics card and ignore the analog signal. If your NVIDIA based graphics card features two video out connectors (ie VGA + DVI), it does not necessarily mean that it will support dual monitors at the same time. Some NVIDIA based graphics cards will look similar to Figure 2 which features a DVI-D connector as well as a VGA connector. These cards generally will only support a single display at a time - not dual monitors. The reason for having two different types of connectors is to allow you to connect either an analog or a digital display to your PC. What type of connector on my GPU do I use to connect my 3D TV? Can I use a VGA monitor with the GeForce GTX 1080/1070/1060 since I only see a DVI-D port on the card?